Halloween is one of Those Holidays: you know it's coming (the same time every year), but it still sneaks up on you. At the last minute, you realize you need a costume—and with stores already sold out, it's time for do-it-yourself solutions. Here are three ideas for Halloween costumes that look great but take very little time. The patterns can be downloaded right to your computer. Purchase the downloadable PDF patterns for these gorgeous glow-in-the-dark knitted designs by Lisa Barnes of LMB Designs here: http://www.kreinik.com/shops/Knitting-Patterns/. 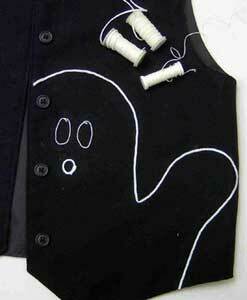 They knit up quickly and dress up any outfit (even office wear) for a spirited yet classy costume. Halloween can be a stressful event if you wait until the last minute to get candy or costumes. So stay one step ahead of those negative spirits and make these clever outfits this weekend. Have you used metallic threads in your weaving projects? The first reaction we get when people see woven projects with the added metallic is "Wow!" followed by "It looks so beautiful with the metallic!" Here's your chance to try these shimmery fibers that will make a special project more eye-catching. 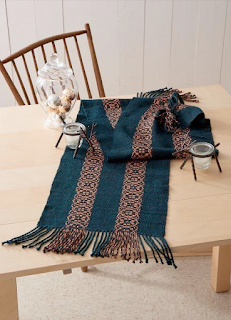 Pick up the latest issue of Handwoven magazine and start with the Turned Overshot Runner by Deb Essen. From the issue: "This beautiful turned overshot runner by Deb Essen would make the perfect decoration for any table. The shimmering, 6-shaft runner is woven using a supplementary warp which means you get the elegance of overshot without having to switch shuttles. Woven using wool and Kreinik metallic threads, Deb’s runner is an absolute delight to weave." The instructions can be found in the November/December 2015 issue of Handwoven magazine, published by Interweave Press: http://www.interweavestore.com/weaving/weaving-magazines/weaving-magazines-handwoven. You need 164 yards (which equals one 150-meter cone, or three 50-meter cones) of Kreinik Heavy #32 Braid in color 027 Orange to make this project, which you can order here: http://www.kreinik.com/handwoven.htm. 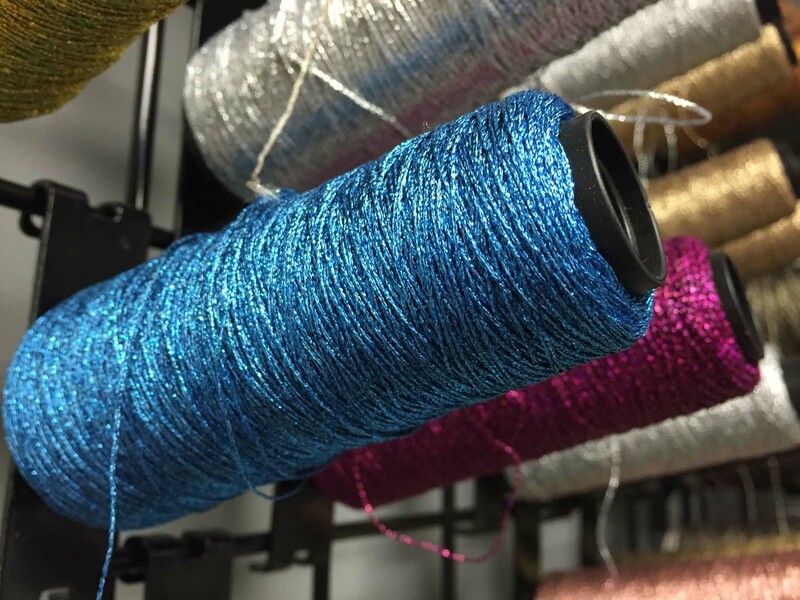 Consider Kreinik metallic threads for your next special occasion weaving project, to add a stripe or motif area of sparkle. Focus on a little sparkle so as not to overwhelm and to keep the cost down. "The metallic threads as weaving yarns is so enticing and has sooooo much potential," said Deb, who is also using the metallics in Zoom Loom projects like her new Christmas Ornaments kits; see http://www.djehandwovens.com/. The most common question about metallics in weaving is about shrinkage. All types of yarns shrink differently, even at different temperature levels. Kreinik fibers are hand and machine washable, but, since these metallics are inelastic compared to some other types of yarns, we recommend sampling the threads with the weaving yarns you plan to use before starting your actual project. Another common question is "Where do I get large cones?" Weavers need more material than you can find on the common small black Kreinik spools. Since we make our own threads, we can cone any amount. You can special order large cones through your favorite yarn store, on the Kreinik website, or come by the Kreinik Factory Outlet store (1708 Gihon Road, Parkersburg WV 26102, open during weekday business hours) for special savings on selected cones. Don't wait any longer—your next weaving project will be even more gorgeous and awe-inspiring with motifs or stripes of soft shimmer. Your "what to wear this Halloween" quandary is solved with two new knitting patterns from Kreinik and LMB Designs. 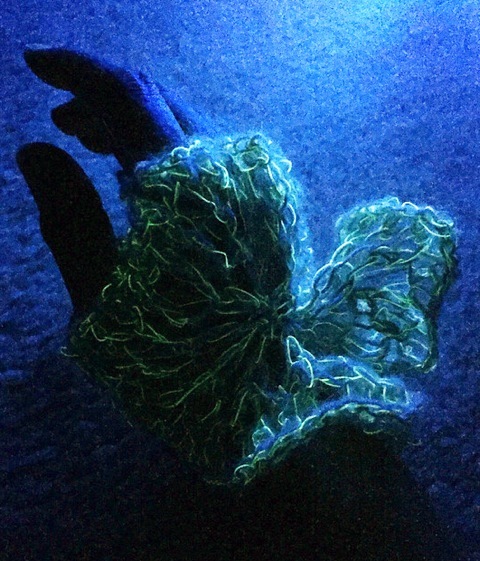 The unique designs are pretty (with a twist) and versatile: lacy for daywear, edgy for nighttime, and fun for party time (they glow in the dark). 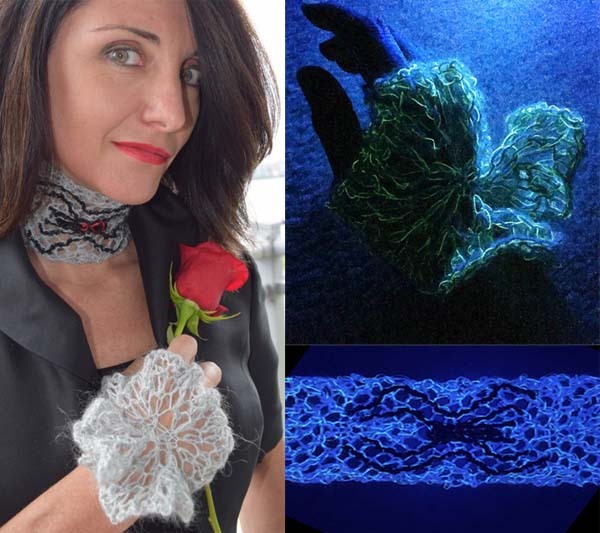 Complete the look with the matching Widow's Spider Web Wristlets, available as a separate downloadable pattern here: http://www.kreinik.com/shops/Widow-s-Web-Wristlets.html. Both can be worn beyond Halloween, too: the choker will be a conversation piece at your next ComicCon, Spiderman viewing party, or knit-out. The wristlets will keep your wrists warm in a cold office, plus serve as an elegant accessory to wear at a formal event. The background yarn (Kraemer Yarns Fountain Hill Brushed Mohair) is a lovely neutral gray, so it will coordinate with any outfit. The spider is created with duplicate stitch, a useful tool to have in your knitting repertoire due to the embellishment possibilities. If you've never tried duplicate stitch, this project is a perfect first-timer. 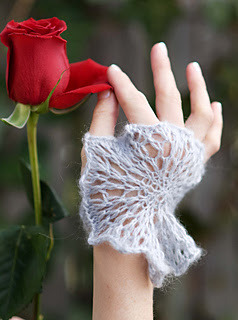 Love the designs but don't knit? Simply buy the supplies and pattern, and ask a knitting friend to make one for you (they'll probably want a set for themselves too). Both projects are easy weekend or weeknight projects that can be finished quickly. You can buy the Kreinik threads on the Kreinik website or through your favorite shop.